April 22, 2012 - The Museum of Flight in Seattle unveiled the first sections of the NASA Space Shuttle Trainer, three Engine Bells marking the first of several shipments of the trainer, which will be housed at the Museum’s Charles Simonyi Space Gallery. Museum of Flight President and CEO Doug King hosted a brief news conference to announce the arrival and to unpack one of the three Engine Bells, which are approximately nine feet in diameter and roughly 800 pounds each. The Shuttle Trainer is being delivered in several stages in the coming months, with the most recognizable portion, the Crew Compartment tentatively scheduled for delivery on June 16 aboard NASA’s Super Guppy aircraft. Built in the 1970s, the Shuttle Trainer is the only one of its kind in the world and is the simulator in which every space shuttle astronaut trained for space flight. It will be on display in the 15,500-sq.-ft. Charles Simonyi Space Gallery, where it will be joined by a collection of other rare space artifacts including Simonyi’s Soyuz TMA-14 spacecraft and interactive exhibits showcasing space travel from the earliest days of the space shuttle program to the future of commercial space. The Space Shuttle was a partially reusable launch system and orbital spacecraft operated by the U.S. National Aeronautics and Space Administration (NASA) for human spaceflight missions. The system combined rocket launch, orbital spacecraft, and re-entry spaceplane with modular add-ons. The first of four orbital test flights occurred in 1981 leading to operational flights beginning in 1982. 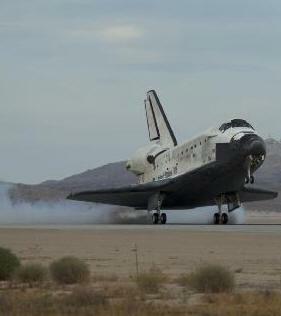 It was used on a total of 135 missions from 1981 to 2011 all launched from the Kennedy Space Center, Florida. Major missions included launching numerous satellites, interplanetary probes, Hubble Space Telescope (HST), conducting space science experiments, and constructing and servicing the International Space Station. Major components included the orbiters, recoverable boosters, external tanks, payloads, and supporting infrastructure. Five space-worthy orbiters were built; two were destroyed in accidents. The Space Shuttle at launch consisted of the Orbiter Vehicle (OV), one external tank (ET), and two Solid Rocket Boosters (SRBs). It was launched vertically like a conventional rocket with thrust from the two SRBs and three main engines. During launch, the external tank provided fuel for the orbiter's main engines. The SRBs and ET were jettisoned before the orbiter reached orbit. At the conclusion of the orbiter's space mission, it fired its thrusters to drop out of orbit and re-enter the lower atmosphere. The orbiter decelerated in the atmosphere before flying like a glider but with reaction control system thrusters before landing on a long runway.